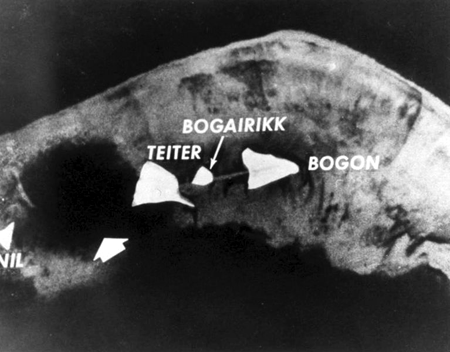 Kort over Elugelab før og efter den første november 1952. 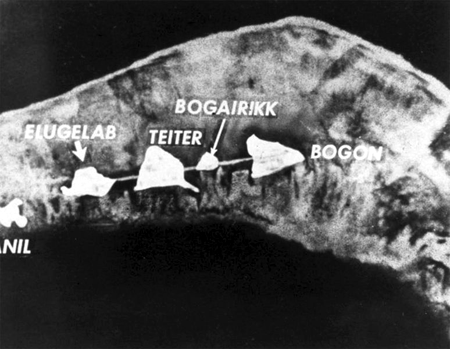 Serie på to amerikanske brint- og atomvåbenforsøg i Forsøgsområderne i Stillehavet i den første del af den kolde krig. '"The island of Elugelab is missing!" President Eisenhower heard this short report on the Mike shot in Operation Ivy from Gordon Dean, Chairman of the Atomic Energy Commission. Mike was the first full-scale hydrogen explosive device to be tested, yet was only a scientific test of a thermofusion implosion device concept. Mike was not a deliverable weapon. The island where the device was detonated was vaporized. The hole Mike left was big enough to accommodate 14 Pentagon-size buildings and deep enough to hold 17 story building under water, in a crater one mile in diameter and approximately 175 feet deep. Mike's yield was an incredible 10.4 megatons, signaling the proof-tested expansion of the nuclear explosive technology concepts from nuclear fission to thermofusion. Thermofusion is the same process that occurs in the core of the Sun. This test, however, was not the first test of a liquid thermonuclear explosive. 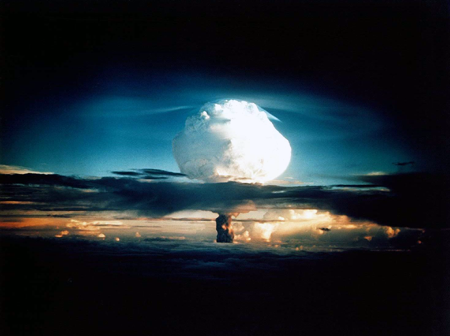 The first test ever conducted into the fusion principle occurred during Operation Greenhouse at Eniwetok in 1951, with the 225 kiloton George test. Another test of hydrogen in the center of a nuclear weapon before Mike was during the Greenhouse Item test at Eniwetok, proving a critical stockpiling yield efficiency concept, called "boosting."' Mike was followed on November 15, 1952 by the King shot, the largest all-fission device ever tested by the United States. It was a uranium super oralloy Mark 18 prototype implosion core in a Mark 6D casing, with an advanced warhead that enabled it to produce 500 kilotons of equivalent TNT explosive energy. Forsøgene kom efter Operation Tumbler-Snapper og før Operation Upshot-Knothole. Se tillige: Operation Anvil ; Aqueduct ; Arbor ; Argus ; Bedrock ; Bowline ; Buster-Jangle ; Castle ; Chariot ; Charioteer ; Cornerstone ; Cresset ; Crossroads ; Crosstie ; Cue ; Dominic ; Dominic II ; Dugout ; Emery ; Fishbowl ; Flintlock ; Fulcrum ; Fusileer ; Greenhouse ; Grenadier ; Grommet ; Guardian ; Hardtack I ; Hardtack II ; Julin ; Latchkey ; Little Feller ; Mandrel ; Musketeer ; Newsreel ; Niblick ; Nougat ; Phalanx ; Plowshare ; Plumbbob ; Praetorian ; Project 56 ; Project 57 ; Project 58 ; Project 58A ; Quicksilver ; Ranger ; Redwing ; Roller Coaster ; Sandstone ; Sculpin ; Storax ; Sunbeam ; Teapot ; Tinderbox ; Toggle ; Touchstone ; Trinity ; Tumbler-Snapper ; Upshot-Knothole ; Whetstone ; Wigwam. Analysis of Radiation Exposure for Navy Personnel at Operation Ivy. Science Applications, Inc.. 1983. - 78 s.
Hacker, Barton C.: Elements of controversy: the Atomic Energy Commission and radiation safety in nuclear weapons testing, 1947-1974. University of California Press, 1994 - 614 pp. Hansen, Chuck: The Swords of Armageddon : U.S. Nuclear Weapons Development since 1945. United States Air Force Lookout Mountain Laboratory, Air Photographic Charting Service, Hollywood, California: Operation IVY (1952).